By Tim Royner: Barry Hearn says the proposed mega-fight between Amir Khan and Kell Brook could be delayed until 2019, as both are interested in chasing world titles in their respective weight classes. The Matchroom Boxing promoter Hearn is worried that a loss for either fighter could hurt the interest from boxing fans in a Khan-Brook fight. As it is, both fighters have arguably lost popularity with their past defeats. Brook lost twice in a row to Errol Spence Jr. and Gennady Golovkin before rebounding in beating Sergey Rabchenko in the 2nd round on March 3. Khan was knocked out in the 6th round in May 2016 by Saul Canelo Alvarez before coming back nearly 2 years later to defeat Phil Lo Greco. Negotiating a fight between Brook (37-2, 26 KOs) and Khan (32-4, 20 KOs) won’t be easy because the two fighters are in different weight classes. Khan, 31, only wants to fight at 147, and Brook now fights at 154. Brook didn’t do well the last time he competed at 147 last year in May against Errol Spence Jr. in losing an 11th round knockout. Khan wants to fight for a world title at welterweight against one of the champions. It would seem that his best chance for a world title would be to fight the winner of the July 15 fight between WBA World welterweight champion Lucas Matthysse and Manny Pacquiao. Spence would give Khan a title shot this year if he were interested in facing him, but he’s probably a little dangerous for him. Khan’s recent 1st round knockout victory over gatekeeper Phil Lo Greco (28-4, 15 KOs) on April 21 seems to have planted some ideas into his head, making him believe he’s got the talent to compete with the best fighters at welterweight. Lo Greco is nothing like the top welterweights Spence, Terence Crawford, Shawn Porter, Danny Garcia, Jeff Horn, Matthysse and Keith Thurman. 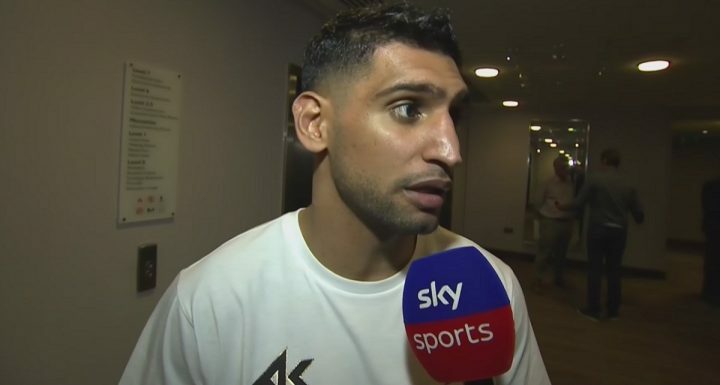 “At 154, we would argue, don’t take it, to Amir, because he’s not a 154 fighter,” Hearn said to skysports.com. ”Whether there’s a compromise at something like 150, and we can do the fight. I get the gut feeling that it will come after they’ve had their respective world title challenges in their respective weight divisions first,” Hearn said. Brook, 31, would probably take the fight with Khan right away, but it doesn’t look like there’s a lot of interest on his part right now. Khan talks of wanting to fight Brook, but he seems to want a title shot against one of the top welterweights a lot more. After Khan’s recent stoppage win over Lo Greco, a legion of boxing fans started saying that they believe that he would beat Spence. Khan might have heard the many fans, because he seems to fancy wanting to fight for a world title. That may or may not against Spence. Khan could opt to fight the winner of the Pacquiao-Matthysse fight or wait to face the winner of the WBC ordered fight between Danny Garcia and Shawn Porter. I think it’s a safe bet Khan won’t wait for injured WBA welterweight champion Keith ‘One Time’ Thurman to finish healing, because he’s unreliable right now due to the string of injuries he’s been suffering for the last two years of his career. If Khan and Brook can both capture world titles in 2018, it would make a fight between them so much bigger next year than it would be if they fought each other right now. It’s risky for the two 30-ish fighters to be competing for world title at this point in their careers because neither of them has done well lately fighting at the world stage. Chances high that if they fight for a world title, they’ll suffer losses, but there’s not much you can do to convince them not to take risks with their careers because that’s the type of fighters they are. Brook has had words with WBC junior middleweight champion Jermell Charlo and IBF/WBA champion Jarett Hurd. Both champions would like to fight Brook, and they would jump at the chance to fight him in this year if he was interested in facing either of them. Newly crowned World Boxing Organization 154lb champion Jaime Munguia (29-0, 25 KOs) would also likely give Brook a title shot if he wanted to fight hi. Munguia would be a very dangerous fight for Brook due to his huge size. Munguia is essentially a middleweight masquerading as a 154b fighter. Just how the 21-year-old Munguia is able to make the 154lb weight limit to fight at junior middleweight is the big question because he looks huge after he rehydrates. Brook would have more to lose in terms of popularity by fighting Munguia in getting beaten than he would have if he challenged the unbeaten Hurd or Charlo for their titles. For that reason, it would probably be better for Brook to stick with the more established champions Charlo and Hurd than the upstart Munguia if he wants to stay out of trouble and ruin his fight with Khan for next year. Khan recently inked with Eddie Hearn’s Matchroom Boxing stable, hoping it would make it easier for him to rebuild his career, negotiate a fight against Brook, and then fight for a world title. Hearn has a lot of pull with the sanctioning bodies and the other promoters, and he could likely match Khan against any top fighter in the division if he wanted to. Hearn works with all the U.S promoters, and he doesn’t have politics that holds him back in making deals. Hearn has an adult approach to making fights with different promoters. He’s not held back by petty grievances the way some promoters are. That’s one reason it’s a big plus that Hearn is now expanding his promotion to the U.S to make the biggest fights in the country with his new steaming deal with DAZN. Khan can fight Brook this year if he wants, but it looks like he’s going to take a stab a fighting for a world title against one of the welterweight champions. The chances finding success in his world title venture at 147 are better than Brook’s. For Brook to win a world title, he’ll need to beat one of these tough champions at 154: Jermell Charlo, Jarett Hurd or Jaime Munguia. It might be better for Khan and Brook to listen to Hearn and make their fight this year before they fight for a world title, as there’s too much that could go wrong for both of them if they challenge one of the champions. Khan’s punch resistance is shaky, and he would be at risk even in facing the winner of the Pacquiao vs. Matthysse fight. Right now, there’s a lot of money for Khan and Brook to scoop up on Sky Box Office and from the gate if they face each other later this year in December after taking soft touches this summer. But if they choose to gamble and fight for world titles in 2018, then it’s quite likely both of them will be knocked out and they’ll be starting 2019 in much worse off shape than they are now for a fight between them. Hearn would obviously still make the Khan vs. Brook fight next year with both having lost their last fights, but you would have to believe that the money they will make will be far less than it would be if they fought each other right now. Brook and the hulking 6’1” Hurd have exchanged insults recently. Hurd, 27, is even bigger than middleweight champion Gennady Golovkin. Brook was taken apart like a piece of at the seams by Golovkin in losing a 5th round knockout in September 2016. Brook tried to tough it out after suffering an eye injury in the 2nd round against Golovkin, but eventually he had to quit because of the swelling. Hurd would be a very tough foe for Brook with a huge payday if he were to win that fight. The trouble is that Brook would be making a huge risk in facing Hurd, and it’s more likely than not that he’d be shelled to pieces by him in a comparable manner as he was against Golovkin. If Khan and Brook didn’t have so many opportunities in their respective divisions, it would be easy to put a fight together between them right now. The fact that they both have some many options available still makes it difficult for them to rush into a fight against each other, because it appears they’re saving this match until they’ve exhausted all other career options.